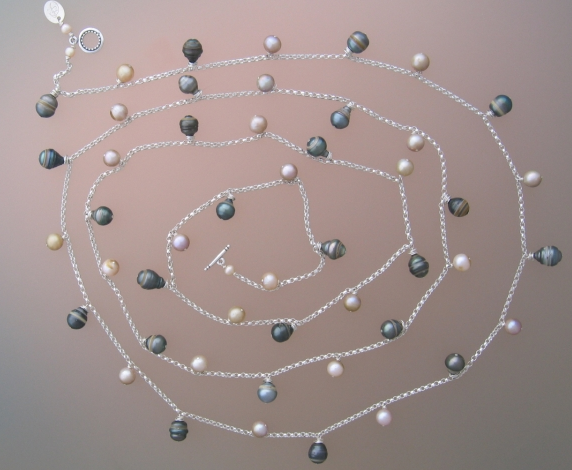 Reader Susan sent this photo of her 3-4mm round white pearls (probably akoyas), a still-lustrous 18-inch strand, sentimental to her but too small as is for a grown woman. She asked if I had ideas for updating it, and wondered if they "were worth it". I'd say yes! Let's look at two options. 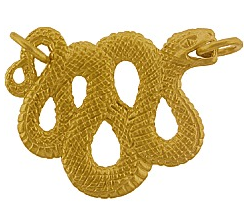 The gold-plated snake, an Asian motif, adds substance and texture; this style attaches to the strand, rather than hanging off it. Should she have a few dull pearls on the strand, this would allow her to pick the best for the reno. (Price, $63). And see the centre loop of the snake? She could hang a pearl, gem or crystal bead from there. 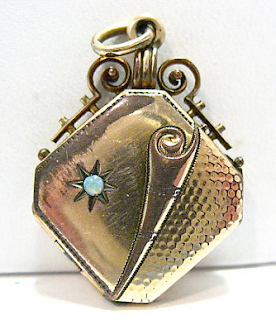 A Victorian locket, set with an opal, would be a nostalgic choice. This one, 20mm, is 10k gold and made with intriguing detail. Price, $262 from Etsy seller Syboll Munger. A vintage charm makes a witty pendant. This 14k diver is from BeladoraII (price, $495). You might already have a charm, but I like her retro vibe. I wouldn't go too sweet (heart, flower) or the necklace will look like you stole it from a 12-year-old. Also, the charm needs some size; Ms. Diver is a generous 1 1/2 inches. The dated filigree goes, right now! New clasp could be a small 24k vermeil fishook from Nina Designs about $17. Susan could also troll rummage sales for broken pieces that include a clasp; I once found one for 50 cents. She'd look for the approximate size she has now, so it does not overwhelm the strand. Don't buy a bail before you choose the pendant, it may not fit. Bails are designed differently to accommodate top, side or front-drilled pendants. (See Nina Designs for many examples of bails.) Just like you'd choose the setting for a ring, choose the bail; it's literally front and center. 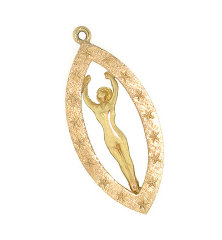 A snap or removable bail (sometimes called an "enhancer" style) would allow Susan to change pendants. Susan could entirely transform her necklace to wire-wrapped dangles on chain. This is not a bead-store proposition. I'm showing an example by my pearl-design idol Zara Scoville of Priceless Imperfection, and it is she whom I recommend for the project. The piece could use only Susan's pearls, but I'd suggest adding small keshis, for interest. Zara can choose pearls that harmonize; the wirework may be gold or silver. 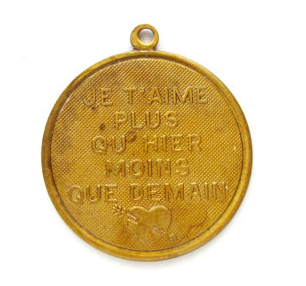 In Plan B, the necklace is transformed, but the sentiment remains. The cost for such restyling is higher than for some pendants, but she has a completely new piece. Does Susan need a jeweler? For Plan A, Susan could buy her pendant and findings, take or send it to a bead store, and have it strung. This is the lowest-cost option if she has a clear sense of what she wants. If unsure about design, a jeweler can help. In that case, she should bring along images of pieces she likes, or make sketches. 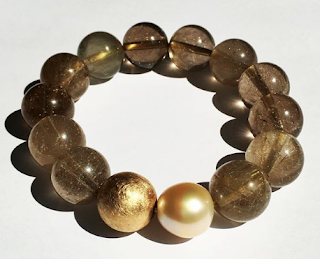 I've recommended several who specialize in pearls, like Zara Scoville, Sarah Canizzaro of Kojima Company and Céline Bouré of Kokass; Etsy is another good place to check out talent. Given Skype, a design meeting is just a click away. If there is no enthusiasm in the artist for undertaking the project, no matter how much you like his or her work, say thanks and leave. And vice-versa: an artist may be willing, but if his work on display is not your taste, the final product (no matter how versatile he claims to be) will not please. Craft shows are another place to troll for artisans; if you like the work displayed, return during a quiet spell to discuss your project. For Plan A, besides the cost of materials, Susan will pay for the stringing ($15-$60 depending on who does the work, and how complicated the necklace is) and a design fee if a jeweler gives significant input. For Plan B, Susan will pay for additional pearls, if any, and for the making of the piece. Susan could also just change the clasp and restring, then layer the necklace with others that she has, but that's not what she requested, and also, I wouldn't want those pearls abraded by chains or metal near them. The only thing that should touch a pearl is another pearl, or at least no metal, if you want to keep them in good nick. Jewelers like to say you can step on a pearl; you can– it will not shatter unless there is an internal fault or it's one of the hollow 'soufflé' pearls- but the surface nacre will scratch, and metal is the meanie. Susan has some decisions to make. Should she try to spend as little as she can, or is it worth investing in something special? Would she be happy with a $5 Etsy pendant or is a pearl or gold charm worth saving for? Does she want to keep the necklace as a strand, adding a pendant, or redesign it in an exciting new style? Whatever her choice, she should aim for a necklace she doesn't want to take off. Pearls are meant to be worn; by spring, they could be out in the sunshine! Do you have other ideas for Susan's necklace? We'd be eager to hear them! How interesting, and I love the pink pendant idea. Thank you! Thanks Duchesse. First, it's nice to know that my pearls are nice ones (I always thought they were). I think I am going to go for the simple option. I like the idea of the pearl pendant for example. A question: I am assuming that matching the white color is not an issue, but rather approximating a similar luster? I also like the idea of a charm, but think it would probably take a long time to find the perfect charm which speaks to me. I definitely want to find the right bale (?) that can be snapped on and off for a change. Do you have a link which shows us this kind of connecting piece? Susan: I would not add a white pearl pendant, it will look too weddingy and not very interesting. That's why I showed you peach, but grey or lavender would be good too. Yes, look for similar lustre- you will see it easily. I already linked to Nina Design's page of bales, in my post! Though they are silver, they give you an idea of styles. Or just do a search on "jewelry bales" and then search "removeable", "snap" or "enhancers"
It should be in same finish as the pendant (matte or shiny) and not too heavy. Francie; It is classic, and you can;t go wrong with a big glowing pearl. But it should be a beautiful pearl, which is why I'd talk to the folks @ Kojima Company. What good ideas. I have some pearls that were my grandmothers. She was a tiny woman. I am not. Your ideas give me some possibilities. Thanks so much for the ideas, the links and the question list at the end of the post. These will all be a big help in re-imagining my small strand. Your posts are thorough yet not overloaded - I'm learning a lot. MadameLà-Bas: Small gold (or stone) spacer beads can extend a small necklace, or a clasp incorporating and inch or two of chain. Also, some pendants (like the dragon) attach to two ends, adding length to the piece. LauraH: Thanks... I could write much more but prefer to respond to questions. As a jewellery designer and artisan, I have always been fascinated by pearls. A graduated strand I inherited from my Grandmother, circa 1908 lay in my jewel box unused. They were purchased directly from a ship in from the Orient by my Grandfather, shortly before he died. While they are by no means perfect,they have sentiment, and I chose to use the 2 mm ones along with larger freshwater and stick pearls to create a necklace. Believe me, knotting 2 mm pearls is no small task! I kept aside the larger and more lustrous pearls and created 3 drop pendants to be worn on silver chains...one for me, one for my daughter, and one for my grand-daughter as little pieces of history. LauraMary: What an inspired use of your family pearls. Graduated strands that only go up to a still-petite pearl, look lost when worn with today's clothes and accessories, so I would pull them apart as you did. They also look good worked into bracelets or earrings, where size can be teeny (2mm!) and still lovely. Duchesse, i don't know a lot about jewelry, and learn a lot from your posts. You mentioned options for those who don't live in areas where there are talented jewelry designers; I suspect that I DO live in such an area (Houston, TX, big city with lots of rich people!). But I would have no clue how to find a skilled designer. The drawback to the big city: too many choices and too much ground to cover. JillAnn: Ask women you know whose work they like. 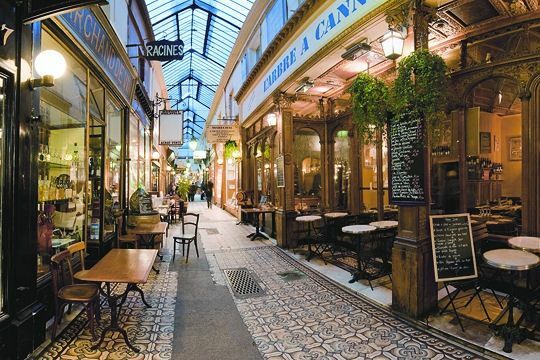 Go to neighbourhoods with interesting design stores and mosey around. Visit the Houston Metal Arts Guild's site (www.hmag.com) and go to their shows. Use the web: In thirty seconds I found one in Houston (Erica DelGardo) whose work looks appealing. Hope this gets you started. Or you could work with with one of the artists I've mentioned here; all accept commissions and I have never had a problem working from a distance, thanks to e-mail and Skype. I followed Duchesses link and found this bail that specifically mentions attaching it to a pearl strand. Oh, you have inspired me. I have some pearls in the safe I brought back from China-a stretch bracelet that broke. I hand picked the pearls and they are nice sized. A good project for this weather. Susan: Enhancer-type or removable bails are sold online by many jewelry supply companies, in materials from gold to pot metal. It's important to choose one that complements the pendant. fmcg: Wish we could see what you make! On another topic, I've been inspired by your posts to take a serious look at buying my first cashmere sweater or cardigan. Researching online has been an eye-opener. Not too much seems to be made in Scotland/UK anymore, even Pringles is made in China according to wikipedia. And some of the product made in China is just as expensive as that made in UK. When a retailer dances around the where-is-it-made question, with little or no specific info on their website, I get nervous about dealing with them. I've read your previous cashmere posts and since some of them go back a few years, I would be interested to know your current thinking on quality, fit, etc. since I will likely be buying on-line with no opportunity to try on. Also, I am still having flashes...sigh...is cashmere just too warm for me now? Apologies if this is a tired topic for you. Susan - I think a large white irregular pearl would be nice. Unlike Duchesse, I prefer the monochromatic look. But I also really like that diver charm. LauraH - I definitively recommend Brora over all the other cashmere I've tried:). Is it wise to allow the bale to directly touch the pearls on either side? The effect is marvelous, but I wonder about damage to the original pearls. Thanks LPC, I appreciate your feedback. I read your blog often and it's really helpful and enjoyable - this reminds me to sign up for the RSS feed. Anon@10:35: The correct stringing places knots between each pearl (and therefore, bewtween the bail and the neighbouring pearls.) 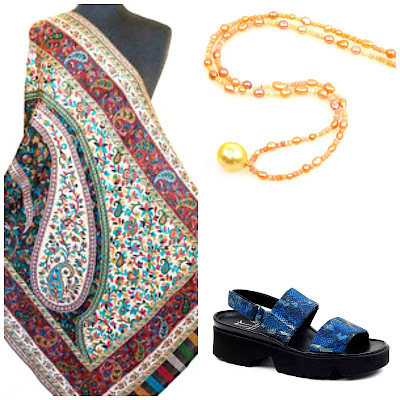 The pearls and all findings should be given to the stringer. The bale will touch the knots, not the pearls. 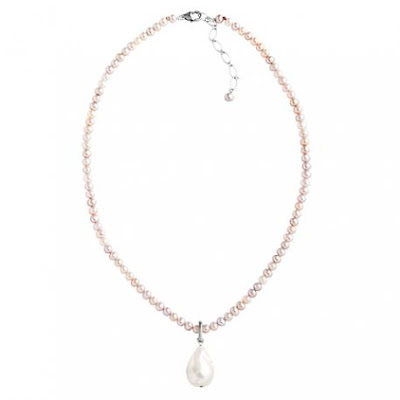 The same principle applies to the clasp, it also is strung to not touch the pearls. Where women get in trouble is buying an enhancer, which sometimes has a big, wide bail,and squeezing it on to their existing necklace. If that is done, the enhancer can abrade the pearls. LauraH; I have written many posts on buying cashmere; go to the right menu bar and scroll down under labels. It is the quality of the fiber, from raw to finished yarn, and the way it is processed, that determines the quality, not country of manufacture. Duchesse, while I love your writing in general, your repurposing pieces have been my favorites. Hearing your coat refashioning experience, seeing your Tahitian redesign, and now Susan's options has been really fascinating. I have two mink stoles I wear around the house to keep warm, but they stink (good lord, they must be from the 50s, I'd say, and who knows the last time they were conditioned) and I'm thinking my 50th birthday gift in a few years will be to work them into something new. I adore my pearls, but they're a good size for me (one strand is 18 in of 6.5-8mm,, slightly graduated, the other is about 65 in of NATURAL 9mm that I got for a song 15y ago), so there's no need to remake them. One finds old pearls all the time in jewelry shops, though, and I may pick up a less than fab set to have something made like that amazing final piece you showed. You are inspirational...if not a bit more out of my league in jewelry stashes! Gretchen: A good fur designer can do something like cut your miks stoles into strips and produce a knitted bolero, or make you a chic hat (if not all skins are salvageable.) But wearing them around the house is so Auntie Mame! Oh I would love to see the natural pearls. 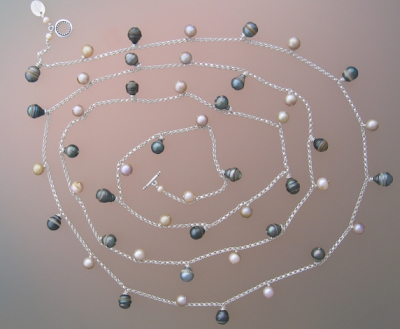 And even if your perls are a good size, once day you might want to change the clasp, to give yourself a 'new' piece. Finally, I'd buy "less than fab" but still insist on good luster, few blemishes and wonderful colour. No blinkers. The quality will show even in small pearls. You don't need AAA but AA for sure.